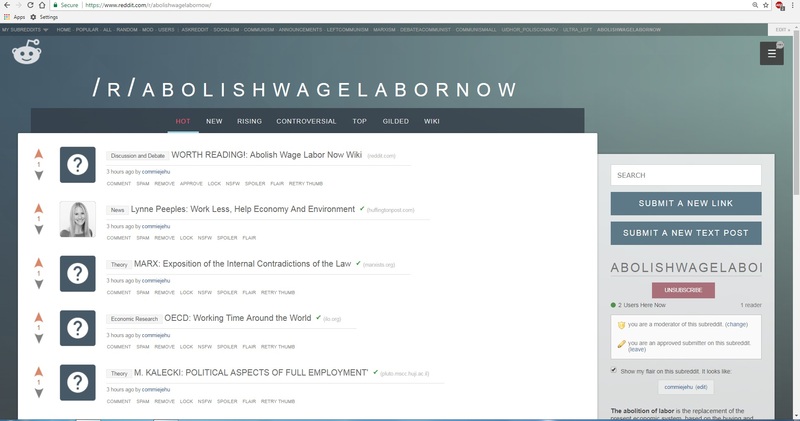 The “Abolish Wage Labour Now” subreddit is now live. Anyone can subscribe and post to it. The purpose of the subreddit is to gather in one place all the arguments for why the abolition of wage labor through our direct action is a practical solution to the failures of 20th century communism. Through this subreddit we hope to address many of the questions people might have about the practical implications of a movement aimed at the immediate abolition of wage labor and importance of the that movement for communists of all persuasions. It will also address some of the theory behind the idea, as well as highlight some of the research on the subject. Many communists today assume that the abolition of wage labor is a distant ideal, unrealistic as an immediate aim for our action. This subreddit is devoted to challenging that idea. The abolition of labor is not a distant ideal. We can bring it about in the near future by our determined direct action. In the same way the actions of a few challenged segregation in the 1960s, we can challenge the continuation of wage slavery today with the aim of its complete abolition in some definite period of time.